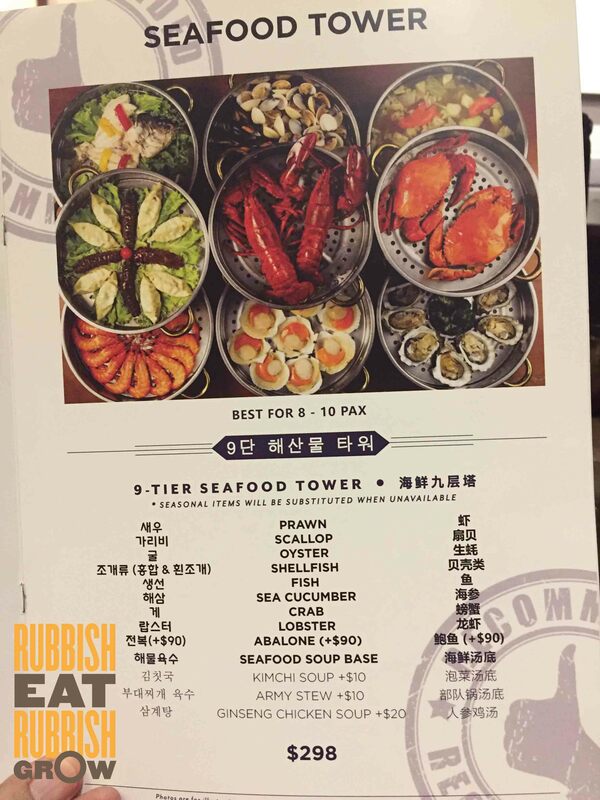 K-Tower, Amoy Street: Tower of 9 Stacks of Steamed Seafood, 0 Calories, Right? Steamed seafood is trending this year. Instead of a hotpot or a BBQ plate in the middle, steamed containers are used. There is the Chinese style, served at Ah Hua Kelong, Sea Tripod, Steam Box, and Just Steam. 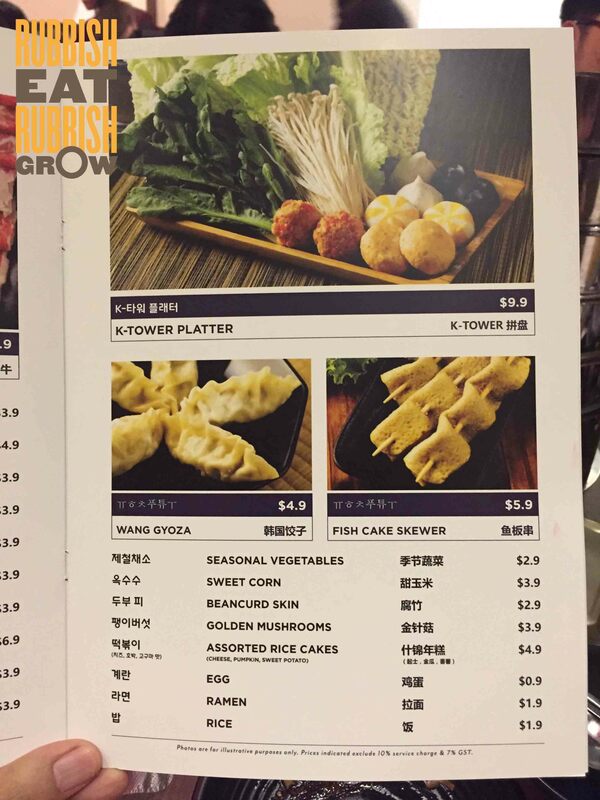 Then there is the Korean style at Captain K Seafood, House of Seafood, and K Tower at Amoy Street. 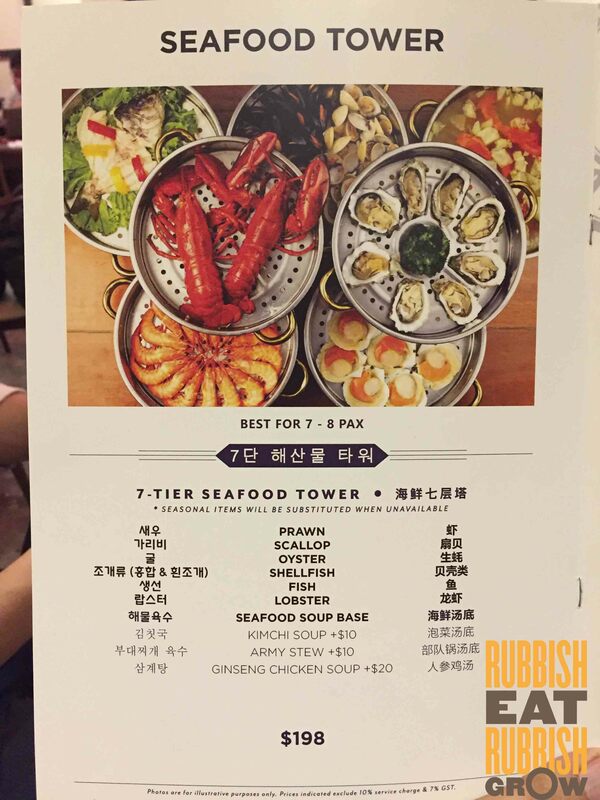 The difference between Chinese and Korean restaurants is that the Chinese places porridge at the bottom whereas Korean uses the steam from soups, and they stack the seafood in tiers (see photo below). The essence of the seafood will drip into porridge/soup. K-Tower is helmed by Chef Sky who has trained in Korea for 2 years and has 10 years of experience with Korean cuisine. 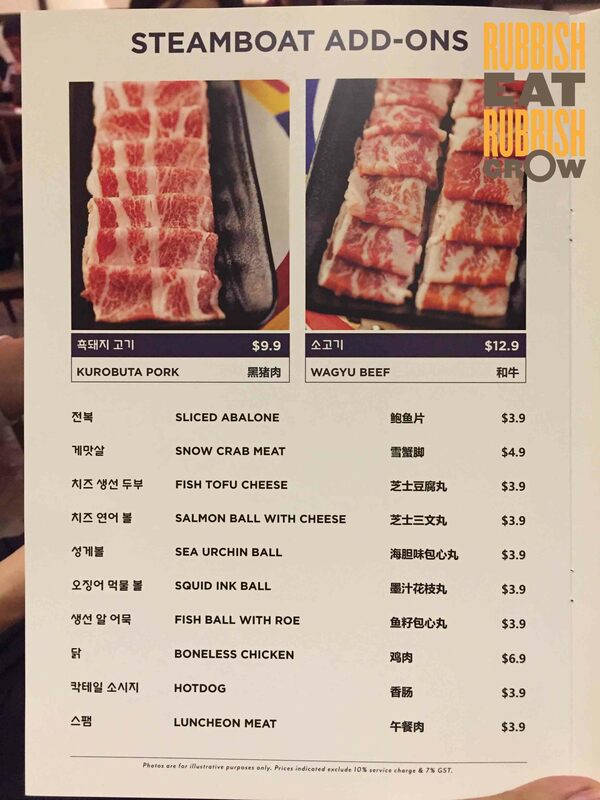 For lunch, there are affordable set menus starting from $9.90; it includes a drink, a side dish, and a main like shake shake rice box, Korean chicken, or army stew. Shake shake rice is a Korean lunch box that you shake to mix the ingredients before you eat it. If you’re going for lunch, between the shake shake rice and the ginseng chicken, opt for the former. The ginseng chicken is more Chinese than Korean; Chinese ginseng chicken is savory and heavily seasoned whereas Korean’s is mostly dependant on the bitterness of the ginseng. The ginseng chicken is symptomatic of what requires improvement in the restaurant: the “Korean”-ness of the place. As I was eating, I didn’t think the restaurant is very “Korean.” For example, the Korean pancake ($14.90), they make it thin and crispy to suit local palates, and while it is addictive, I prefer the traditional Korean style. 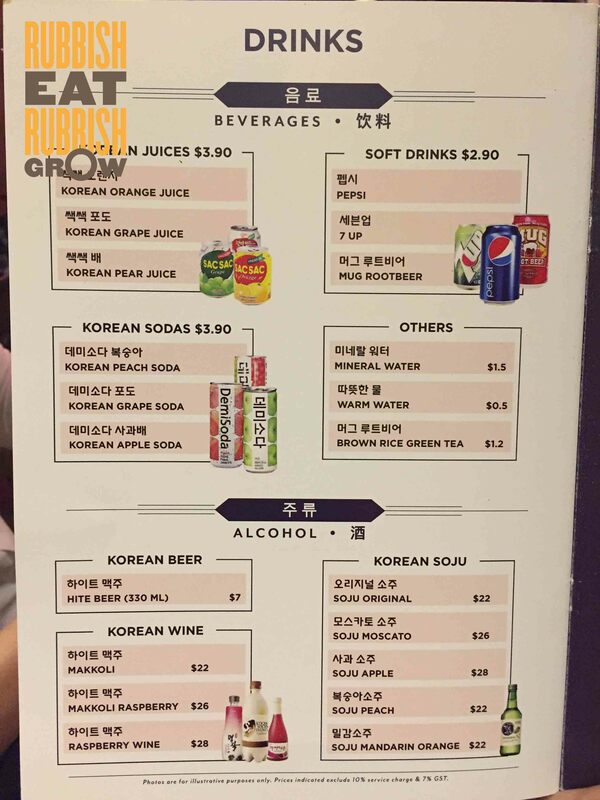 The Korean fried chicken is sweet, but unKorean. The ginseng chicken, Korean pancake, and fried chicken are tasty, but I wouldn’t classify them as Korean. 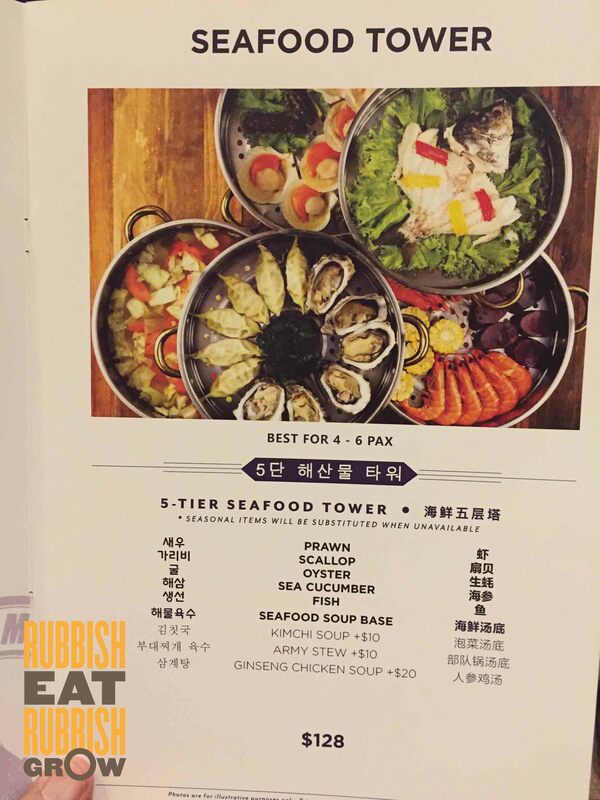 For dinner, the seafood tower comes in tiers of 3 ($58), 5 ($128), 7 ($198) and 9 ($298). 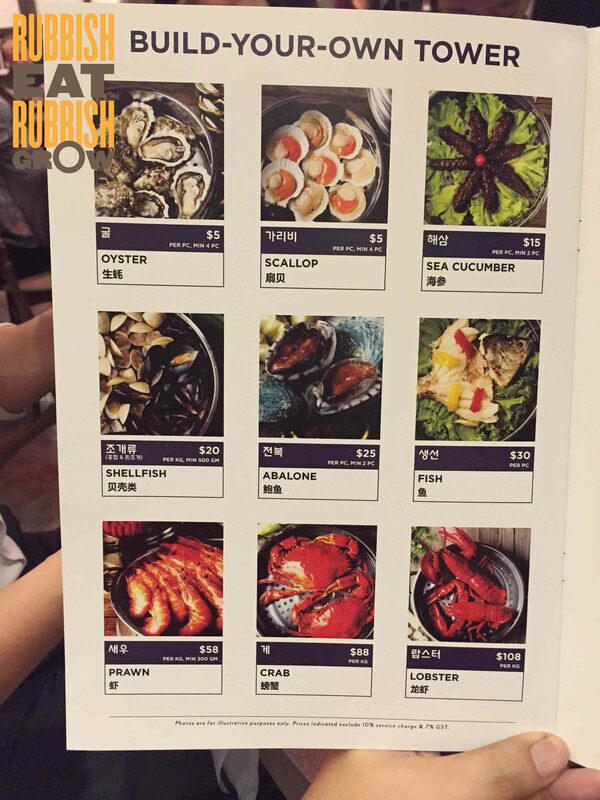 You can also add items such as $25 for a piece of abalone, or lobsters at $108/kg. Towards the end of the meal, when you reach the base where the soup is, you can add more ingredients and turn the soup into steamboat. 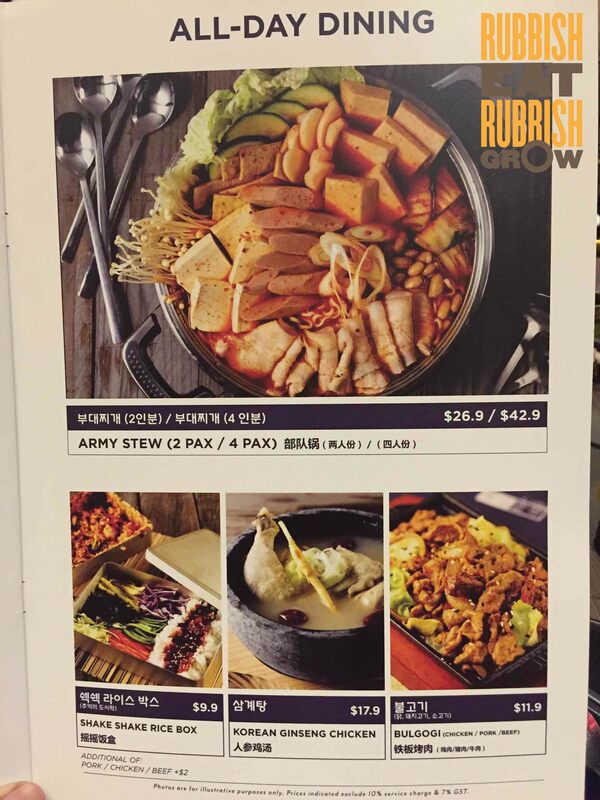 For the soup, there are 4 types: seafood, kimchi (addition $10), army stew (addition $10), and ginseng chicken ($20). We had the army stew, and it was umami with all the essence of seafood dripped into it. SHIOK. They use live seafood, which are swimming in tanks at the back of the restaurant. As a result of the freshness, the prawns are super duper sweet. The snapper fish is succulent and very fresh, not fishy at all. They are steamed without any seasoning, so a light touch of soya sauce is good enough. They also provide gochujang and sambal which has a kick, but I’d prefer they not give the sambal because it’s not Korean. 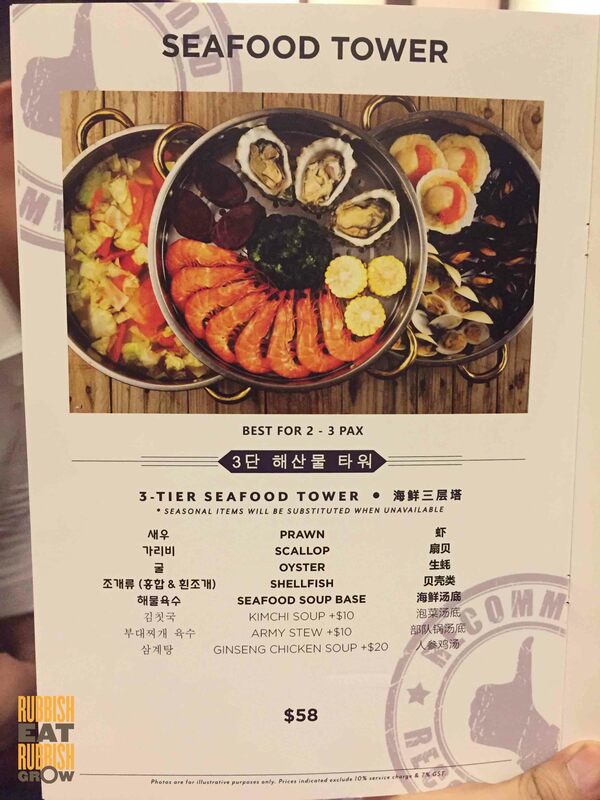 Although I prefer restaurants that showcase a chef’s culinary skills, and not just simple steaming, K-Tower, which serves fresh seafood, is a fun place to gather with friends and family.